The need to repair corrupt MS Word 2007 file can successfully be fulfilled with the help of an application offered by our esteemed group of organization. 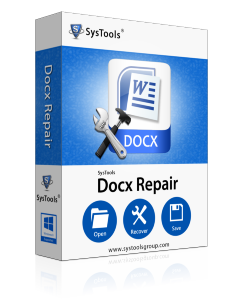 Our Docx Repair Application is instilled with the most number of technical inputs that help users in accomplishing the process of repair accurately. The sheer ease of performance offered by our Docx file repairing application is hard to be availed by any other similar application. Hence, investing on this extremely pocket friendly tool to recovery corrupt MS Word 2007 data is the most suitable step to be taken in such scenario. In such circumstances, all you must do is get our MS Word 2007 recovery application which owns the expertise to repair corrupt MS Word 2007 files and later versions. The software can perform the recovery of unlimited number of files. The software is designed to render the recovery of Docx files from any possible case of corruption like : virus infection, improper system shutdown while the file was being used, Trojan attack, etc. With this tool you can also repair corrupt MS Word 2007 file from any level of corruption whether it is caused due to common causes of corruptness like virus, or extreme or integral level of depravation. MS Word 2007 recovery tool is designed not only for the technically sound set of users but also for novice users who are totally new on the technical front which is all possible due to the user friendly algorithms instilled within the tool.